For many American fans, Jackie Chan didn't exist until the '90s. English dubbed theatrical and home video releases of martial arts gems like "Rumble in the Bronx" and "Supercop" established Chan as an essential international action star. Still, in the eyes of near-sighted Hollywood executives, Chan's star power was proven by the financial success of mediocre chop suey action films like "Rush Hour" and "Shanghai Noon." In a sense, they were right. After all, if Chan is versatile enough to look good after being exported to Hollywood, what can't he do? Still, many of Chan's biggest hits in China and his native Hong Kong remain sadly underseen by many Americans. His innovative, death-defying stuntwork may have set a high bar for modern action filmmaking, but to many, he's the guy that asked Chris Tucker if he understood the words coming out of his mouth. That is sadly reinforced thanks to the US release of "Police Story: Lockdown," a box office hit in China that is only receiving a VOD and highly limited theatrical release (ex: no New York venues, and only one Los Angeles theater is currently booked). Chan's latest attempt at aging gracefully may impress diehards, but many American audiences won't even know that "Police Story: Lockdown" (originally titled "Police Story 2013") is being released a year and a half after its Christmas 2013 premiere. To be fair, "Police Story: Lockdown" isn't one of Chan's better recent efforts. Director Ding Sheng had far greater success with Chan in 2010 with "Little Big Soldier," a period war film about an over-the-hill soldier (Chan) who tries to collect a reward after he kidnaps a rival army's general. But "Police Story: Lockdown" does say a lot about how Chan has aged as a star. In 1985, Chan starred and directed "Police Story," Chan's fifth directorial effort and a big box office hit in China and Hong Kong. In a recent Village Voice interview, Chan told me that it took him a long while to feel comfortable as a director. Chan said that he didn't even feel comfortable by 1989, when he and "Police Story" producers Raymond Chow and Leonard Ho worked on "Miracles," a charming, formally challenging gangster comedy inspired by light-hearted Frank Capra comedies "Lady for a Day" and "Pocketful of Miracles." In other interviews, Chan adds that he wasn't writing scripts in a traditional way. For "Police Story," he and co-writer Edward Tang characteristically structured a screenplay around a list of stunts. But if you watch "Police Story" today, you'll find that it's not just a film-length sizzle reel, but rather a consistently entertaining highlight of Chan's stunning '80s period. 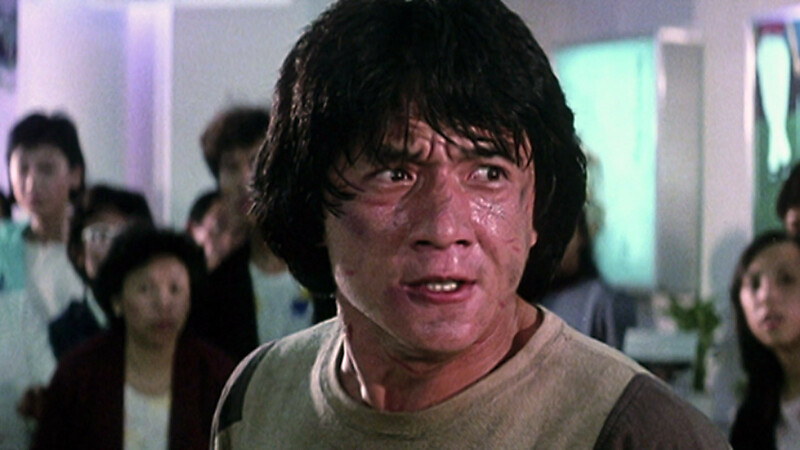 "Police Story" is, realistically, largely enjoyable as a series of brilliant set pieces. But the film's slapstick-y comedic set pieces are almost as charming, particularly the one where Chan juggles several rotary phones with his hands, feet, and neck. The film's plot and characters are however incidental, a fact that was confirmed by the way that only one of the five other films titled "Police Story" are directly connected to the adventures of Kevin Chan (Chan), a hot-headed cop who stubbornly takes down the mob after he's assigned to protect a witness for the prosecution. 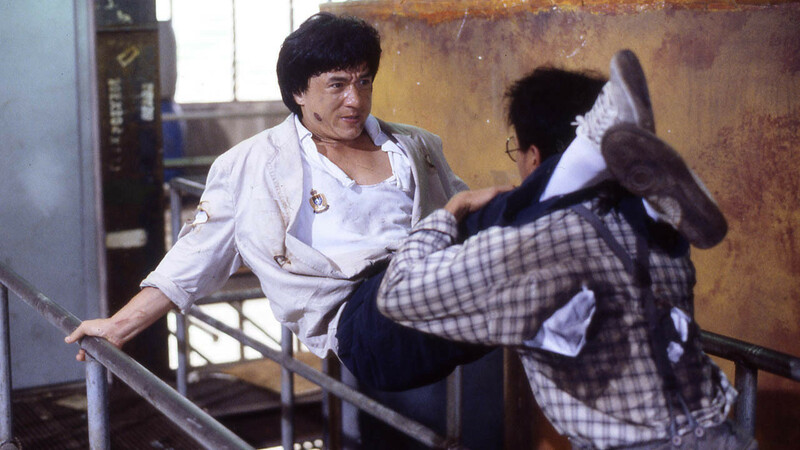 Chan is at the height of his powers in "Police Story," an incredible showcase for Chan's JC Stunt Team. You can't tell by looking at the film, but "Police Story" was filmed between "Project A" (1983) and "Armour of God" (1986), two of Chan's most dangerous films. "Police Story" was made during a period of Chan's career that was defined stunts like the crazy car chase that kicks off "Police Story" and leads multiple cars barreling down a hill and through a shanty village. That chase climaxes with Chan pursuing and halting a hijacked bus--on foot. In real life, two stuntmen were thrown out of the bus when Chan stopped it at gunpoint. This sudden stop was an unexpected result of the bus's air-brakes. So when the bus stopped right in front of Chan, two actors launched out of the double-decker's second-tier windows. Chan did not stop shooting. In fact, he remained in character, checked the side doors, and tried to coax the remaining hijackers out of the bus. Then he called cut, and rushed over to check on his stuntmen. Chan's drive to top himself is also apparent in the final 20 minutes of "Police Story," during which time Chan and his stunt crew barreled through about 700 pounds (Chan's estimate) of collapsible sugar glass. The most insane stunt during this sequence is a multi-story slide down a vertical pole draped in decorative light bulbs (the bulbs were real, and active since the mall was active and Chan only had so much time to shoot). Bear in mind: Chan attempted this stunt after damaging his spine during a clock tower fall during the filming of "Project A." Chan's "Police Story" pole jump was also filmed a year before Chan sustained a brain injury from falling out of a tree while making "Armour of God." Nevertheless, in one take, Chan shimmied down a pole, burnt the skin off his palms, slammed through a canopy of sugar glass, and chased a stuntman off-camera (there were at least 14 cameras filming Chan at this moment). He then celebrated with a drink with his stunt crew. At 6am. Chan's unholy dedication is also apparent in swathes of "Police Story 2" (1988), a low-key sequel that takes place right after the events of "Police Story." It's no coincidence that "Police Story" and "Police Story 2" have the best stuntwork in the six-film series since they're the only two films directed by Chan. Kevin Chan returns but this time he's investigating the extortion of a high-profile company by a group of bomb-making crooks. "Police Story 2" is significantly less stunt-intensive than its predecessor, so it gives you more time with Kevin, and his surreally devoted girlfriend May (Maggie Cheung). It also gives viewers more opportunities to revel in Chan's winningly earnest fascination with the Hong Kong police force. He doesn't go as overboard for the cops as Michael Bay does for the US army, but you can see Chan's attraction to the police in several scenes where Kevin and his team track their suspects. 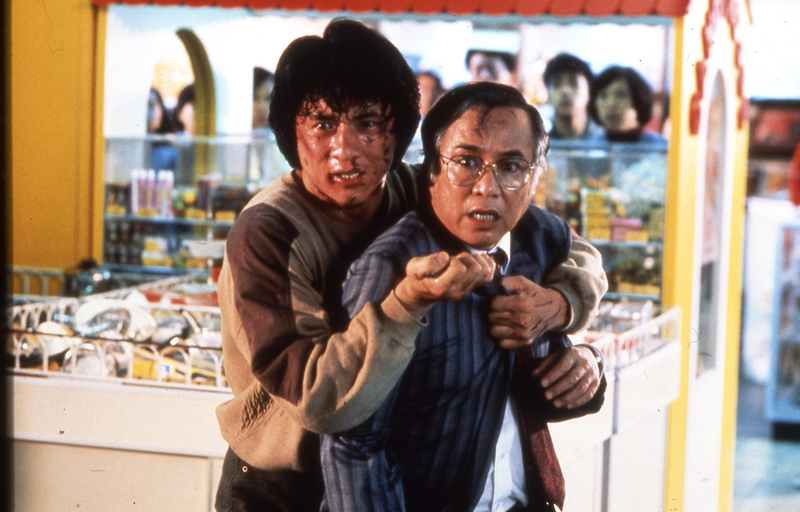 Then again, while hunting down crooks may be a team effort, subduing them is still a one-man show in "Police Story 2." That film really comes alive during its concluding set pieces, including a (literally) explosive multi-part showdown in an abandoned warehouse involving plastic barrels, fireworks, and a lot of kicking. "Police Story 3: Supercop" (1992) and "Police Story 4: First Strike" (1996), the first two "Police Story" films to be theatrically released in America, are the least like the first two "Police Story" films. Both films are unfocused and feature cartoonish political commentary (Chinese cops are hyper-disciplined and efficient while Russians all look like pro-wrestlers who dress in comically cheap suits). There are some terrific and visually impressive stunts in both films, including a scene where Chan dangles from an airborne helicopter ("Supercop") and some fun underwater brawling ("First Strike"). But both films also have way too much dead air, signaling the beginning of the end of Chan's daredevil career phase. Chan starts making mediocre Hollywood and Hong Kong films two years after he stars in "First Strike." Many of these films are forgettable, though "Who Am I" (1998) and "Gorgeous" (1999) both have their moments. So it's no surprise that "New Police Story" (2004), a grim, narratively-unrelated "reboot" of the "Police Story" series, is underwhelming. Chan plays a disgraced cop who tries to pull his life together after a group of thrill-seeking, video-game-obsessed criminals kill nine police officers under his command. The fact that Chan's opponents are influenced by fads like the X-Games says a lot about how desperate to please "New Police Story" is. Still, as illogical and humorless as it is, "New Police Story" does include a couple of decent fight scenes, and a predictably engrossing performance by Chan. "Police Story: Lockdown" (2013) is unfortunately more like "New Police Story" than I'd care to admit (stay tuned for a full-length review of "Lockdown"). It is however also one of the first films in a while that actually feels like a "Police Story" film, albeit one starring Old Man Jackie Chan. Chan still clearly admires police officers' sense of civic duty, and unsentimental at-all-costs attitude. And the action scenes in "Lockdown" are also more like street-brawling than the kind of mannered, balletic combat you'll find in Hong Kong action films directed by John Woo and Johnnie To. "Police Story: Lockdown" may be nowhere near as good as the films that Chan made in his prime, but it puts retiree-aged American action stars' recent vehicles to shame.